In this article we will help you find the best straight razor – both as a beginner or if you are a pro. Before we dive into it – straight razors are also often referred to as cutthroat, barber, cut-throat, cut throat, open, open-blade, straight edge and straight-edge razors -or as Shakespeare would have put it “A rose by any other name would smell as sweet“. With the many straight razors on the market all claiming to be the top pick of the century, or the best straight razors for beginners, it is a daunting process to choose the one most likely to provide you with the most satisfaction. We all want the best for ourselves which is only natural. However, getting the best is not always an easy process. The fact that there are several brands, makes and models of straight razors in the market do not make the decision-making process any easier. 1.7 7. A Shavette – What About It? 7.1 A Closer Look – What Are They? If you are looking for a straight edge razor for beginners, you should read this article all the way to the end and you might also want to check out our reviews of the best kits. Luckily, we have compiled a list of important factors to consider while making the decision. These considerations are designed to add to your knowledge of what is available as well as equip you with knowledge of the qualities making a quality straight razor whether you decide to go for the Editors’ Choice – the Dovo Inox or some other top picks. Top quality blades are produced with subtle but very important differences. Below is information to help with your understanding of these features to assist with your choice. This blade point is semicircular. It is devoid of sharp ends. Compared to other blade types, it proves to be slightly more forgiving. As such, it is better suited for beginners learning the art. Square point blades have a straight point profile. This terminates into a sharp point that is perpendicular to the cutting edge of the blade. It proves to be particularly useful in shaving smaller areas. It does, however, require some experience to handle correctly. The profile designed on a French point blade looks like a quarter circle. It has a sharp point at the very end just like the square point. Other persons refer to it as the oblique point. The blade width refers to the distance between the cutting edge and the back or dull edge of the blade. The width is expressed in simple 1/8 increments. As such, a 4/8 blade translates to half an inch wide while the 8/8 blade translates into a 1-inch wide blade. I should point out that the width of the blade does in no way affect the closeness of the shave. This is provided you hone and strop the blade to give it the required sharpness. Smaller blades tend to be easier to strop than larger ones. Large blades provide a more aggressive shave. They do, however, prove very difficult to shave under the nose especially for beginners. This goes for other hard to reach areas as well. Smaller blades provide ample room to see where and how you are shaving. On a broad spectrum, you only have two choices to make with regards to the straight razors. This is either a vintage or modern open version. They vary greatly and have their own pros and cons. If you are into buying old products are restoring them to their original glory, or close to it, then vintage straight razors will prove to be the best and by far the most attractive option on the table. The fact that you can get them at an affordable price is certainly a plus. You should be warned though. They do require some tender care to restore them to their original glory and be perfect for shaving. If you are a beginner, it is recommended that you hone the shaving skill first with the modern open model before jumping to the vintage varieties. Modern razors as you would expect have the added advantage of featuring the new technology available in the market. They feature better craftsmanship and more often than not, they have years of experience and shaving backing their design and engineering. Needless to say, the condition of modern version is way better than that of a vintage blade. But then again, a vintage well-maintained blade is usually of the same quality if not better than the modern alternatives. No, temper in this context does not refer to those moments you flip out on your family and friends. It refers to the blades ability to retain its sharpness as well as its ease of sharpening. Blades come with three tempers including soft, medium and hard. Generally, a hard temper model will keep the edge for longer while soft tempered edges are easier to sharpen. Straight razors are designed from carbon steel or stainless steel. Stainless steel usually is less expensive and also last longer between sharpenings. On the other hand, carbon steel blades are higher in quality and are slightly more expensive. Most men prefer getting razors produced from stainless steel. The combination of quality and affordability is too sweet to ignore. Grind refers to the concave indentation on the blade. A full hollow grind usually makes a blade sharper and lighter. On the flip side, a less hollow grind is not as sharp and is considered more suitable for beginners in the game. 7. A Shavette – What About It? A shavette (trademark of the German manufacturer Dovo) can be likened to training wheels on bicycles. They are a perfect choice for beginners learning the ropes and making the transition between normal shaving and the use of straight razors. They resemble straight razors in many ways. They feature a standard double-edge disposable (replaceable) blade – in some cases the same kind that you would still use with a safety razor. No stropping and honing involved. It is a great way to get the hang of the shaving motion and generally, the technique of straight razors. They are far cheaper compared to actual open models. There are now several manufacturers that are using this system with their own personal touches – such as Feather and Parker. Dovo is a German company. It is reputed for providing high-quality products. The Dovo Inox is one example that is hard to beat. This beauty is also a contender for the best quality open razor for newbies. Let us have a closer look. Dovo has been producing superior blades for a long time. This is since 1906. They have over time built a highly respected name and solid reputation for themselves. A reputation for excellence and that is well deserved. Solingen, the part of Germany where they are based, was already popular for producing quality cutting tools when Dovo got into the shaving industry. Dovo prefers to ship all of its razors ready to go out of the box. This is to mean that before shaving, you do not have to take it through any setup or assembly. The Dovo blade is full hollow, sharp and light. Additionally, it features a rounded point that is highly suitable for beginners. It is made of stainless steel that is durable, elastic and hard. The blade is a round point type – 5/8-inches wide. This is an added plus for the open razor lovers. The handle is made from olive wood and looks great. Additionally, it has a strong grip and will not slip from your hand. The edge of this blade is fine. It is as fine as gets when it comes to quality blades. This not only enhances the shave quality you get but also provides you with a graceful feel requiring no extra pressure. The Dovo Inox features a simple design that is stylish and elegant. It looks great as all Dovo straight razors do like for example the popular Dovo straight razor Carbon (sold out on Amazon). Dovo Inox is a great choice for the best straight razor for beginners category. We, however, do not want to overemphasize this fact as it also works well for experienced shavers as well. The Dovo products are beginner friendly, and they are affordable making them a rather wise long-term investment. In my personal opinion – the Dovo Inox deserves the best straight razor award! When it comes to open razors, you will notice (if you haven’t already), the sharpness of the blade is not everything. But nonetheless, it still means a lot. The Feather Artist Club SS comes in first place courtesy of its sharp blade. With this beauty, you will not have to worry whether the blade is sharp enough or not. Additionally, you have the tech backing of a famed Japanese company. This company and brand are one of the most respected and reputable in the industry. Not only are the making great straight razors, but they have also created a stainless steel safety razor masterpiece named Feather AS D2. Simply put, it is the best of the best. Here is what has skyrocketed this model into fame over the past few years. First and foremost the Feather SS Artist Club is a straight razor like any other with regards to its body design and shape but features a disposable blade. As such, you are in a way getting the best of both worlds. The sharp blade requires no stropping and honing. Its maintenance is a walk in the park, and it can easily be replaced. But this introduces a new concept of removing and replacing the blade. Before you freak out, the removal and replacement process is a walk in the park. All you have to do is pinch the razor head and allow the blade to drop from the socket. It is an easy and fast process. You do, however, still need to exercise caution throughout the process since after all, you are dealing with sharp blades, and any mishap could certainly spill a bit of blood. You will be pleased to note that the blade head is spring mounted. This contributed to its ease of blade removal as well as its ease of cleaning the Feather SS with water. I should mention that the blade is also disinfectant safe. With that, let’s have a look at some of the other features of the Feather SS. The Feather SS features a resin handle. This handle sets it apart from its competition. It is heat resistant and gives a superior grip. Switching hands to get to the hard to reach and sensitive places such as the jawline and neck are easier with this innovation. While the handle is also shorter than that of many others the majority of reviewers feel it comfortable in their hands. The sharpness of the blade and the overall design allow for shaving without applying undue pressure. The handle takes 4 different Feather replacement blades (Professional, Super, Light, and Pro-Guard) that will allow you to adjust your shave to suit your skin type and beard coarseness. The Feather SS is comfortable and has a lightweight design. This makes it very easy to maneuver and control. Ultimately, the goal is to get a close shave every time you place the handle on your skin. The Feather SS achieves this with great finesse. The craftsmanship coupled with the design of the Feather SS makes it very easy for newbies to handle. Shaving with an open razor no doubt requires care and technique as discussed in this piece. But it certainly does not hurt to have a friendlier learning curve. While you will pay more for the Feather SS straight razor, it is without a doubt a case of you get what you pay for. This straight razor is needless to say superior to most others and will last for ages. Feather SS is a long-term investment and is highly rated. The Parker SRW Shavette is designed with professionals in mind. It is however still a perfect choice for beginners and experienced shavers alike. The price is affordable and hard to beat. On top of this, it is a very high-quality product. The Parker company has been in the industry for quite some time. In this period, it has proven itself a leader in design and innovation. The stainless steel Parker SRW lives up to the hype and industry high standards. Below are some of the features it sports. Reviewers have taken note of the Parker SRW in their hand. They complement its great balance and weight which make it smooth to use and nick and cut free. It accommodates both half double edge and single edge disposables. These blades are designed to securely snap into the blade holder. The overall design makes it easy to change the blades. It is without a doubt a great advantage for professional barbers who do not have time to waste changing blades. It features a rounded tip which minimizes the risk of cuts and nicks. It is beginner friendly. While the Parker SRW straight razor is not a fancy blade, and the quality is not near what you get with a Feather SS or a Dovo – it is still a quality product that comes with a reasonable price. It is easy to change blades and very suitable for beginners. Despite Germany being the leading manufacturer of quality blades; France is also known for its exceptional steel blades. One of the leading manufacturing companies of handcrafted steel blades in France is Thiers-Issard. Thiers Issard has been in the industry long enough producing good quality products which have allowed them to make their way to the top of the list of the best razor manufacturers. What is outstanding about this French blade is its dependability which will always give you the shave that you desire since satisfaction is guaranteed. However, Thiers-Issard 6/8″ could fetch up to twice the price of Böker, but this could be directly attributable to its good quality and high performance that leaves you with the best shave you could get. This mirror-polished round point blade with a width of 6/8” is a little longer than Böker which makes it more efficient despite the fact that it could demand a slightly more experience hand when shaving with it. A full-hollow designed blade with perfect forging and grounding in France and manufactured with a round nose, it has an exceptionally good look. From its appearance, it is easy to notice its high quality make. The handle of Thiers-Issard 6/8″ is unique, designed with horn scales and with the company’s logo portrayed in black color on the razor, perfectly rhymes with its elegant look. It is designed to provide a firm grip when using it, and the fact that it is perfectly balanced is a plus, which gives you a satisfying shaving experience. Their steel construction is quite excellent, and amazingly among today’s many mass manufacturers, Thiers Issard remains outstanding courtesy of its good quality steel construction on its products. Thiers-Issard 6/8″ needs to be honed to a suitable edge. The honing process requires experience levels which could be uncommon for beginners since it is time-consuming and could be a little difficult. Thiers-Issard 6/8″ comes with several admirable features that most shavers would love having to make their shaving process as perfect as possible. However, this product may not be suitable for beginners since its honing process could be difficult and requires a little experience. If you have a good experience is honing a razor of this class, then this pick could be the perfect one for you. The Boker King Cutter is one of the best in the market. This razor being a product of Solingen, Germany is definitely of good quality with high performance. One great thing about the Boker King Cutter straight razor 140521 is affordability, and it leaves you with a perfectly smooth shave. So what has made it earn its way to top straight razors? Well, if the quality of the product is something to go by, then this baby has it all. Designed with one of the best blades, it very efficient and does its job day in and day out nicely with a minimum of hassles. After using Boker King Cutter, you might never want to try another due to its reliability, performance, and durability. Sometimes this razor comes with a “Böker USA” brand. This should not worry you because it implies that it was assembled in the USA but not that it is made there. Even when assembled in a different country, Boker King Cutter straight razor 140521 maintains its high-quality standard. It is constructed with a 5/8” carbon-steel round point blade that is reinforced with alloy. The alloy enhancement improves the functioning of the blade since it assists the blade to be ground to a suitable edge. With a design of a rounded point that is filled with full-hollow-grind, it is quite easy for beginners to make use of Boker King Cutter with ease. The plastic material used to construct its handle makes the Boker King Cutter straight razor 140521 quite light and can be easily balanced during your shave. Despite the fact that it comes as a “’shave ready”, you need to strop it before you begin your shaving. However, with continual usage, you are going to gain experience and will likely fall in love this beauty. Germany is internationally recognized for its leading role in open razor production. With their quality products, you are assured as a user of a quality product. Boker King Cutter straight razor 140521 is very suitable for beginners and also experienced straight line shavers, and with their affordable prices, nearly everyone can afford it. However, if you are not comfortable with a razor that is built with a plastic handle, then Boker King Cutter might not best suit your taste. It is important to bear in mind that while the shavettes are considered to be more of training wheels in the wet shaving industry, it does not mean that they are of low quality compared to other open razors. This clearly stands out with the Dovo Shavette. 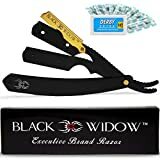 While it is a beginner razor, perfect for beginners needing some time to master the art of this type of shaving, it works great for pros as well. It is a perfect means to try straight shaving while keeping your initial investment to a minimum. The Shavette is well priced, and despite the fact that the square point blade is disposable and you have to replace it regularly, it is a fairly easy blade to maintain. But when you look at it from the perspective of the requirement of sharpening blades, it is not expensive. As a matter of fact, they help you save some cash on this end. While this has the style and looks of a traditional razor, in the way it folds, it is lighter. With the Dovo Shavette, there are also blade holder options with regards to color and blade. These are green, black and clear. Every holder comes with a different blade type. The clear for instance features a double-edged blade that is split into two portions while the black features a blade similar to the double-edged blade, only longer. Last but not least, the green unit features a blade that is stiff compared to the other two types. Its blade length resembles the traditional open razors. Note that the green and black holders are costlier than the clear holder. Also worth noting is that while the blade’s sharpness is a great thing, you need to take extra care not to nick or cut yourself. Everyone has to start somewhere. The Dovo Shavette straight razor is a great starting point. You get a close shave comparable to that from a traditional straight razor. It is perfect for travel as well. The Feather DX is perfect for shaving purists. The beautiful wooden handle is a very classy touch. It delivers a close and smooth shave especially in the hands of an experienced shaver. The Feather shaving Company has been in the game for more than 80 years. As such they certainly know a thing or two about the shaving industry – “cutthroat” to be specific. The Feather DX round point blade is replaceable. The blade is as sharp as you would expect in any other quality product. And the best part is that they need no stropping or honing either. The blade head is spring mounted and features a one-touch mechanism that makes it easy to take apart and reassemble during cleaning. To keep the handle of the blade at your desired angle is a pivot screw. It also helps to maintain constant tension. The handle is made from resinated wood which is a special polymer that is chemical and water resistant and is heat treated. With these qualities, you can easily sterilize the razor in boiling water. The sharp blade means that one wrong move can have you shedding a bit of blood. It is imperative to exercise care and caution while shaving. The Feather Artist Club DX is designed for serious shavers. The price might be enough to discourage first time buyers, but will certainly prove to be an investment that will pay off into the foreseeable future. This masterpiece is perfect for both pros and newbies in the game. Classic Samurai CS-102 has a lot playing in its favor. With it, you enjoy a great shaving experience at a fraction of the cost of other open razors. But this low price does not mean cheap or inferior quality. On the contrary, it is loved and preferred by professionals for its high quality. More often than not, you always get what you pay for. But in this case, with the Classic Samurai CS-102, it is reasonably priced, and the quality is through the roof. It is perfect for beginners and professionals alike. How much are you willing to spend on a high-end straight razor? If you are willing to spend huge, then this model is the one to buy. Its high price could be attributed to the admirable features that this razor possesses. Being a product of collaboration with the famous artisan Max Sprecher, its quality has to be worth your money. Inspired by their slogan “Designed for Life” Ezra Arthur (former Bison) is known for its outstanding quality products. They have earned their way to the top of my list due to the high durability and quality level of the products they manufacture. With an Ezra Arthur + Max Sprecher Custom 8/8, your investment in quality and durability is at its maximum, and it leaves you with nothing else other than fulfillment after using it. Your shaving experience is about to be made better with this outstanding performing straight razor. This large 8/8” quarter-hallow grounded square point blade is constructed using carbon steel with a strength that enables the razor to have a long life. From its durability, Ezra Arthur + Max Sprecher Custom 8/8 could last throughout your lifetime which explains why it comes with a relatively higher price. Its wedge is designed with banded faux-ivory, it is assembled with brass pins, and its handle contains scales constructed from uniquely high-density carbon fiber. Ezra Arthur + Max Sprecher Custom 8/8 is quite different from other razors regarding weight; it is heavier than most others weighing up to 2.5 ounces which could be due to its length. However, you hardly feel the weight once you begin your shaving process. The balance of this razor is made perfect which gives you the best feeling when on your skin during shaving. It might not be the best choice for anyone that is new in using open razors. Despite its good qualities, Ezra Arthur + Max Sprecher Custom 8/8 comes with a price tag that is pretty high. It is thus perfect for shavers who are willing to invest heavily in making their shaving process better since this razor performs well and lasts longer. Ezra Arthur + Max Sprecher Custom 8/8 is not recommendable for shavers new in using this type of razor because it does require experience for careful handling. If you feel that your level of experience is good enough, then Ezra Arthur + Max Sprecher Custom 8/8 best suits you. By referring to straight razors from Germany, I am actually not talking about the entire nation but the small town of Solingen. Located in North Rhine-Westphalia, Solingen has been one of the renowned epicenters of superior quality European cutlery for ages. Being German myself, to some people I may sound biased when I say that Solingen produces the ultimate prime quality blades. But I say so because I know they are good, and I am sure you will agree when you experience their quality. Solingen-branded open razors have proved so good that in 1938 this name had to be given legal protection! Established in 1906 by Carl Dorp and Carl-Arthur Voos, Dovo is one of the most famed straight razor brands from Solingen. In the course of its century-plus existence, Dovo has swallowed up a number of other blade brands such as Tennis, Ankerflagge, Fontana, Kronpunkt, and Bismarck, bringing under one roof extensive manufacturing expertise and experience and thus leading to today’s premier quality straight razors. For Dovo products, even the least pricey is guaranteed to serve you perfectly for many years to come provided you provide a bit of proper care and attention. If you want to get a price-friendly straight razor, Dovo Best Quality blades typically retail at between USD110 (85 euros) and USD300 (230 euros) in the lower-end market segment. Dovo blades come in a wide range of handle materials including Spanish oak, ebony, desert ironwood, buffalo horn, and ordinary plastic. Although wood-made Dovo handles are usually considered water-resistant, this is not actually completely correct since the razor is not meant to become wet. To most people, actually, the handle material is not all that important — just go for the one that appeals to your eyes most. Giesen & Forsthoff was founded in 1920 in Germany’s stronghold of sharp knives, Solingen. In the German shaving context, the brand is known for affordable open razors where the blade does not take a back seat to anyone, but where the handle is a bit more spartan than on many razors from competitor Dovo. Under the trademark “Timor” the Giesen & Forsthoff Company was very popular in Europe and especially in Scandinavia in the period before and after World War II. One of their most popular models is the Timor Straight Razor Plum Wood, Dark Plum. Founded in 1869, Böker is another major manufacturer from Solingen, albeit less renowned than Dovo. With their famed focus on employing the very best in expertise and raw materials, Böker’s main objective has always been to maintain their manufacturing standards at the very highest level. Although the demand for open razors had waned gradually in the years following the end of the Second World War, the global market has seen some massive revival in recent years. While in the past the Solingen Company was mostly known as a hunting knife maker, today they also boast some of the most sought-after shaving masterpieces in the market. Böker designs and manufactures all their straight razors using some of the best traditional techniques, with up to 150 steps being followed to end up with these great products of shaving craftsmanship. All Böker razors are hand-made, with the most pricey model being made from powdered, metallurgical stainless Damascus material and forming up to 180 layers of the renowned steel type for a pocketful price of USD$$$. The company also makes less expensive alternatives like the Boker King Cutter Straight Razor 140521 and the Boker Silver Steel reviewed in our list. Note: While silver was actually used to make Boker blades up to around the year 2000, today this is only a marketing term. The silver made the blade’s surface structure more refined, enhancing the Boker razor’s overall cutting experience. Bonus Tip: You may consider paying for your Böker blades in euros rather than dollars; the euro prices seem better. I am reliably informed that Böker is planning to have more offerings later in the year, so keep your ears on the alert. Personally, I prefer those amazing-looking blades adorned with a traditional hollow-ground shape. However, the imitation ivory-made handle scales are perhaps not everyone’s cup of tea. If you ask any true connoisseur about French open razors, more often than not their immediate answer will be Thiers-Issard. While Dovo can be termed as the Mercedes Benz of the razor world and Boker the BMW, Thiers-Issard is the Aston Martin! Founded in 1884 by Pierre Thiers, the legendary blade manufacturer was borne out of the barrel-chested blacksmith’s own talent and expertise in hammering out prime quality metallic items at the forge, eventually becoming a pro razor designer. Initially, Thiers passed on his master knowledge and business to his son, Pierre Thiers Junior, with other members of their family joining the company later on. Although no longer family-owned, Thiers-Issard still jealously guards the high quality and tradition of its originators, with the fact that they still use only Sheffield steel to make their open razors being perhaps the best evidence of this. For those of us who love great works of art, Thiers-Issard’s special edition models are our mainstay, price notwithstanding. But other less pricey alternatives are available, with good maintenance being the only thing standing between a great Thiers-Issard razor and generations of use. Many buyers may confuse an exchangeable cartridge-equipped Shavette either from Dovo (that has the patent for the ‘Shavette’ Trademark), Parker or a Feather for a traditional open razor, but this is actually a combination of a disposable razor and a straight razor. While it is equipped with the form of a straight razor, this type carries a disposable blade. 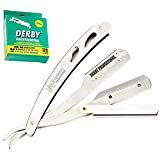 There are many manufacturers of blades for these razors, one of the more popular is the Derby blades. Probably you have felt or seen a Shavette in a barber’s shop when the barber is cleaning up your neck or another customer’s below the hairline. Compared to classic straight razors, these types are normally less costly than straight razors, typically USD 25-50 (20-40 euros) lower. Actually, they are great options for beginners who do not have to hone and strop before shaving, or you can use them as an interim step as you plan to invest in a more decent straight shaver as experience is gained. 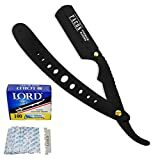 While they might be back and gaining traction in the market, you have to understand that compared to the tools that technology has presented us in the recent past to make shaving more convenient, for effective straight razor shaving, you will need to master the technique. And truth be told, it is not the easiest thing in the world, especially if you are just getting into it. But this is not to say that it is impossible. To get you started, below are the fundamentals of straight shaving you need to get a hang of. Preparing for open razor shaving basically involves two things; sharpening the blade and softening the hair to be shaved. Blade sharpening can be done with a razor stone or a razor strap while softening the hair is done with warm water. You can either take a warm shower and kill two birds with one stone (I personally prefer this – method) or use a wet towel and a face wash or cleanser. If you will be using a replaceable blade you should ensure that it is sharp at all times, replacing often. You can use your fingers to apply the gel, shave soap or one of our tested shaving creams. However, it can prove to be slightly tricky to get the shaving gel under the hairs. It is recommended that you use one of our recommended shaving brushes for this. When it comes to holding a straight edge razor, everyone has their preference. However, one method that most people seem to agree on and has proved to be effective is resting the first three fingers on the straight razor blade’s back and rest the pinky on the blade tang. The tang is the blades narrow part that is just after the pivot. The thumb should rest on the blade’s side close to the middle. Make even and slow strokes with the blade. This is especially important if you are just starting out and are learning the techniques. You should always make the strokes with the grain of your beard. You should always start by shaving your cheeks. Use the free hand to draw the skin upwards to tighten it to avoid nicking yourself. Start from the top and move downwards. Afterwards, you should proceed to shave under the jaw while still tightening the skin in the process. After this spot, shave the upper lip and finally under the chin. Finish off with pampering yourself with either an aftershave or a face moisturizer. So open razors are also known as cutthroat razors. With such a reputation, why in the world would people prefer these? Why risk getting nicked if you make a mistake or do not have the right technique? This is a great question. To answer this question, let us make a comparison between the common razor and cut-throat razors. Why do people still hold them in high regard? A Closer Look – What Are They? They are basically simple shaving tools. They feature a handle and a sharp blade. They have been around for the longest time and are still very effective in shaving. Traditional open razors feature a metallic blade. These blades are usually made of stainless steel which requires constant sharpening and honing to maintain its sharpness. A single blade can, however, last a lifetime when given proper care. Getting a quality straight-edge razor is expensive. When you compare the price to that of other shaving equipment, the price might seem over the top, but the great thing is that they are long-term investments. There is no way around this. Open razors require you to master the shaving technique and compared to other types of razors, they do feature a steeper learning curve. You cannot be completely effective after your first shaving experience. It is not a simple process and it requires patience. However, if you do stick with it, you are sure to be well rewarded. Since you have been doing some research, you most likely are aware that while straight razors share some features, they still are different. Additionally, while they are in many ways one of the simplest shaving tools available, they also are complicated (if that is even possible). Your beloved grandfather may not have used safety razors, but your dad most likely used it on a daily basis. They have been around for quite some time and they still are popular up to date. The beauty of safety razors is that they come in several different designs including 3-piece, 2-piece and butterfly designs. If you have never used these before, you will go through a learning curve. Like shavettes, double-edged razors also feature removable blades. These should be replaced every week depending on your frequency of shaving. Also worth noting is that when buying safety razors, you will spend considerably less than you would when buying straight razors. However, in the long run, courtesy of the replacement blades, they end up being quite pricey. Yes, cartridge razors are practically everywhere. They are available in local supermarkets and convenient stores. Manufacturers run ads for their products on TVs and even at Super Bowl. But is their abundance of supply make them the best option? Well, not quite. Cartridge razors are cheap and portable. They do not have a learning curve to them. A newbie can start using one of these and not nick or cut themselves. They allow a lot of room for sloppiness. Some of the best units features tilted heads. The tilted head is designed to provide a perfect shaving angle and comfort while shaving. As above-mentioned, you can purchase a cartridge razor practically anywhere. That said, what are their drawbacks? Well, they feature low-cost blades. While it is a great thing that they are cheap, they do not provide a close shave. If you are looking for a clean and close shave, you should consider a safety or straight razor. With cartridge razors, you can purchase the kind that is completely disposable. After use, and when the blade becomes dull, you can toss it out in the bin and purchase another. If you are on the move and in a hurry, they also prove to be one of the best. But be it as it may, experts recommend spending some bit of cash to get a high-end cartridge razor. Truth be told, none of the above-mentioned shaving tool options can beat the convenience of an electric shaver. These razors just need to be switched on and they are ready for use. They are available in two different designs; rotary and foil. Some are even great for wet shaving. Whether an electric razor can provide you with a close shave is a matter that can be debated. But then again, what razor option can provide you with a comparable quick shave? It was no easy process compiling this list. Determining the best units came down to research, personal experience and reviews of past users. For example, if a razor has numerous positive reviews and ratings but was not popular or did not have a lot of traffic and sales, we dug into its details to prove its worth on the list. And there you have it. All you need to learn about the famed “cut throat” – best straight razor for beginners and pros.